Every month, someone at my local track would comment about the the Shift leathers I was wearing, commenting on their good looks, how clean they were (“Are those new?!”). My grid mates were even joking with me about avoiding me on the track because new leathers almost guarantee a crash, to cure that ‘new look‘ (7 months into the season, ahem…). Month after month, race after race, this went on. Buncha jokesters & hecklers – the good kind. As the season progressed, the leather continued to break in, and became more form fitting to my body, making an already well-fitting and comfortable suit even more so (see our original review here). Because of it’s excellent construction and near perfect fit, I was confident that if the time came, the Shift Vertex suit would do exactly what it was designed to do – keep my skin intact, and, to a degree, ward off heavy, bone breaking impacts. So far, that performance feature had not been needed, which left me free to keep stylin’ in the pits and on the track. The season had reached into October, I had sewn up the points chase, and so I was feeling in a bit of a gunslinger mood, after suffering the sting of defeat at the hands of series visitor Andre Ochs (a member of a group of young guns I jokingly refer to as the ‘Rubber People’. I think I heard them call me ‘Gramps’ once, so we’re even.). I was determined that he would not repeat. Half-way into the first lap, me and Andre come up on a rider from the first wave in turn 7, a fast(ish) left hander. Andre sets up for an inside pass, I set up on the outside, planning a block pass of both riders going into the banked right hand turn 8. I kinda smirk inside my helmet at my brilliant race strategy. Then, ‘it’ happened…. My wide, outside line put me into a very bumpy strip of asphalt, which, combined with high corner speed and extreme lean angle proved too much for the front tire to cope. In an instant, I was down, sliding, sans previously loyal race bike. I slid for what seemed like far too long on the pavement, and then continued my hockey puck imitation into the trackside landscape, where golfball-sized rocks awaited my arrival. I was expecting to feel significant heat, sliding on the pavement that long. I instead felt only local, mild warmth. I prayed I would not feel the sting of a coarse surface removing layers of epidermis. I thankfully did not. My left hand/forearm and shoulder simultaneously absorbed the impact and then the whole of my left side joined in the party to carry out its duty of abrasion resistance. After making sure I was no longer sliding, I did a function check of my limbs – all present and accounted for and still properly functioning. While I waited for the crash truck, a quick inspection of my left side revealed that all the seams had held together, and none of the leather wore through, so I didn’t feel any ‘new ventilation’. 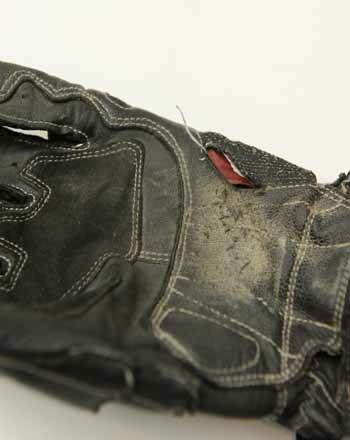 My left glove, however had worn through the stitching of the anti-wear pad, allowing it to peel back, but well-placed inner layers of leather and kevlar appeared untouched, and most importantly, bare skin was not exposed. At home, a closer inspection reinforced much of my trackside observations, albeit, with a couple possible caveats. The left shoulder showed heavy wear at its apex, where the sleeve is joined. The outer layer of leather had worn through in two (small) spots, above and below the seam, largely I suspect, because of the heavy landing and also because of the mostly inflexible shoulder pad underneath. Despite the absence of stitching, the seam did not fail, pulling apart. 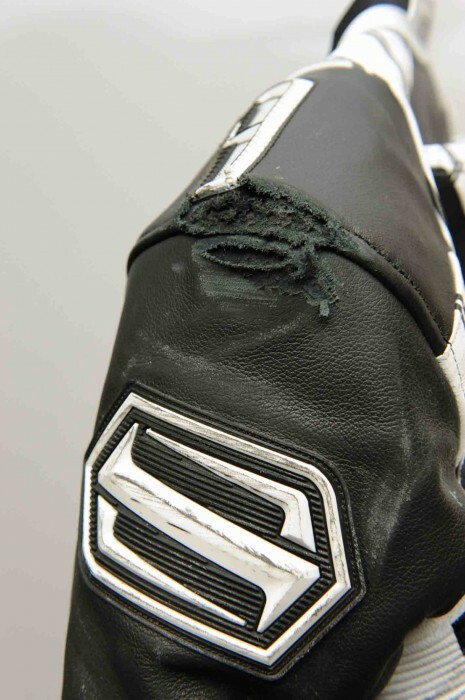 On the forearm, where the stretch panel joins the leather, obvious signs of abrasion are visible, and even though the fabric is frayed along the seam, it did not wear through, and the seam remained intact. Along the hip and thigh, abrasion is evident, but not heavy. Stitching is missing in some of the area, but again, the seams remain intact, and the seemingly decorative Shift lettering actually served to ward off any possibility of the pavement wearing through. The stretch panels were only lightly abraded at the hip. Overall, this is one of the ‘nicest’ crashes I’ve had in my history of get-offs (yes, I’ve had more than one….). Despite the length of the slide, I’ll take that over a ‘this is your life’ highside any day. I’m more than satisfied with the post-crash condition of the Vertex suit and gloves, my earlier confidence in their ability to protect is now reinforced, and the money for these products is well spent. 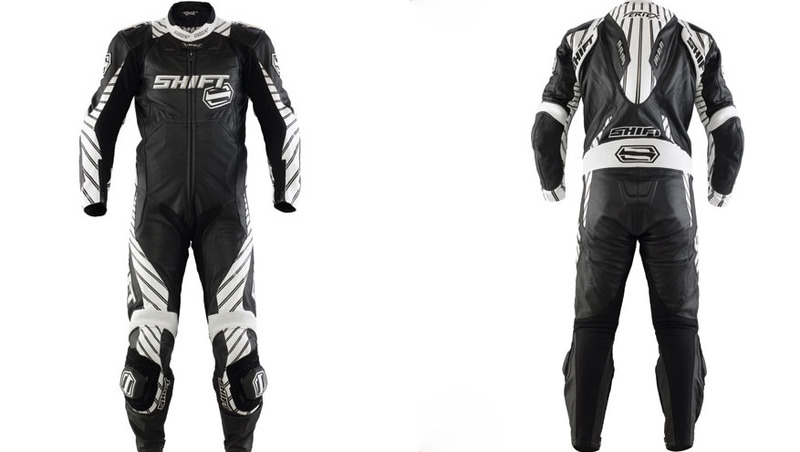 Take a look at Shift’s website for details on their full leathers, and other products. 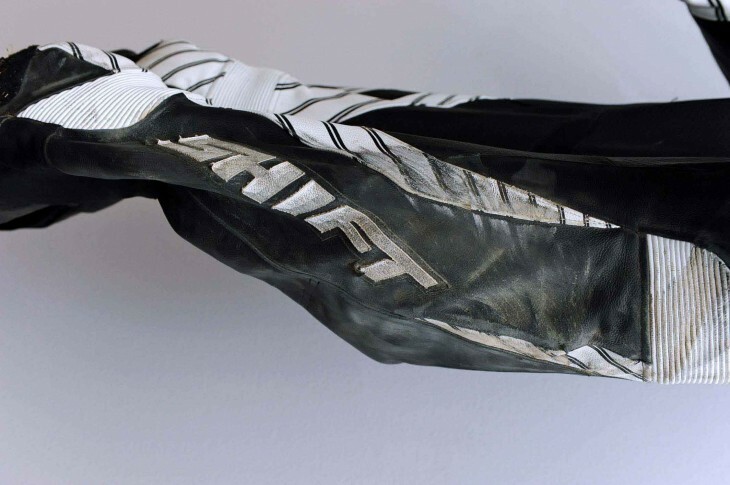 No more jokes in the pits, they’re ‘properly broken in’ now…. Funny, I had a very similar crash in my Helimot leathers at Thunderhill the weekend after Thanksgiving! They are trashed, but repairable. Wish I had chest protection, though! Additional thought – there are schools of thought that the Kevlar etc. reinforcements are bad because they can shatter/cut you…nice example of where they help more than hurt (my view and I’m sticking to it, figuring if the impact shatters the reinforcement you probably have bigger things to worry about anyway). Now this is the kind of testing u don’t see/hear about everyday when it comes to riding gear and how well it stood to the crash. THUMBS UP ! Great Article. Pictures are worth a 1k words. Just FYI, Sport Rider has these occasionally as well. (I may have also seen them once or twice in Cycle World)(the current issue of Rider maybe has one too – boot review actually). So they are out there, and YES they are invaluable (for instance, search the Bay Area Riders Forums for FirstGear pants…I wouldn’t have purchased mine…). Thanks for the writeup, and, as should be inferred, keep them coming – though don’t go looking for cause to do so!! 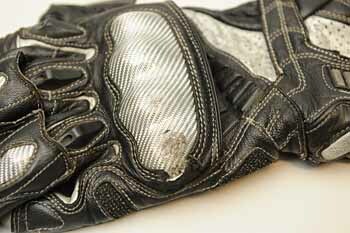 @brinskee, during my racing career, that level of damage would in no way have warranted repairs. Although I was broke and young. I still think I would get some more use out of them even now before repair or replace became a real need though.